In honor of those who died for me. And that for granted I dare not take. 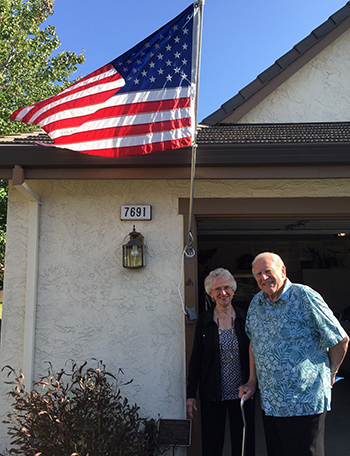 An American flag flies proudly outside the home of Dorthy and Jim Staehs ’55 in San Jose, California, calling attention to a plaque below that bears Jim’s patriotic quote. Those words written by Jim Staehs embody the couple’s passion and patriotism for their country, two values the Staehs hold dear. A lifetime of hard work, selfless service, and dedication have given the Staehs the opportunity to give back to something else the couple holds dear—Texas A&M University. The California residents established a gift annuity through the Texas A&M Foundation that will support the Corps of Cadets after their lifetimes. Dorthy and Jim grew up together in their hometown of Beatrice, Nebraska. After promising his mother to attend one year of college before joining the Marine Corps, Jim moved to College Station, Texas, to pursue a degree in petroleum engineering at Texas A&M. Upon arrival in Aggieland, Jim was assigned to Air Force Squadron 5 in the Corps of Cadets, where involvement was mandatory at the time. Jim was able to balance 19 hours of coursework in his first semester, as well as attend mandatory Corps training every week. However, after struggling in chemistry, a required course for petroleum engineers, Jim made the decision to change his major to civil engineering before his sophomore year. After marrying in August 1953, Dorthy moved to College Station to be with Jim and start their lives together. The couple worked hard throughout Jim’s time at Texas A&M, taking odd jobs around campus to make ends meet. In the spring of 1955, Jim graduated with a degree in civil engineering. Despite the fact that he was unable to purchase his senior boots because of cost, he walked proudly across the stage in his cotton khaki Corps uniform and received his diploma. Throughout their four years in College Station, the Staehs always stood by each other, whether it involved stretching dollars to pay bills or supporting each other during tough times. Jim had the opportunity to work for various companies across the United States after graduation. The Staehs family would move from Kansas to Mississippi to their now-hometown of San Jose, California, in the span of 11 years, three of which Jim spent serving in the U.S. Air Force as a navigator with the Strategic Air Command. After settling in San Jose, Jim decided he wanted to be his own boss, which led him to the beginning of his own small manufacturing company, Jasta Inc.
After 12 years in business, Jim received “an offer he couldn’t refuse” and sold the company to an East Coast firm, enabling him to retire. Jim heard of another offer a few years later, but this time from the Texas A&M Foundation. He learned about the opportunity to give back to Texas A&M and leave a legacy through a charitable gift annuity to Texas A&M. 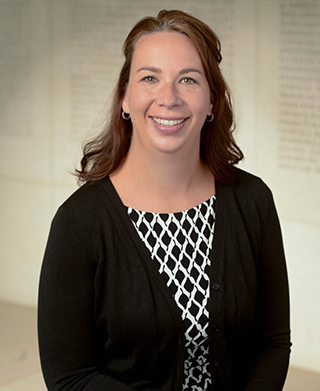 A charitable gift annuity is a contract between a donor and the Texas A&M Foundation. The donor makes a gift of cash or securities to the Foundation, which then makes lifetime fixed payments to the donor, with rates based on their age at the time of funding. Donors also receive a portion of their payment tax-free and an income-tax deduction for making a gift to the Texas A&M Foundation.